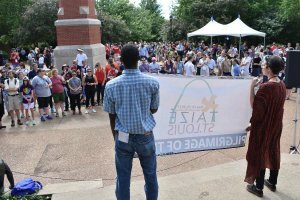 From September 2016 to May 2017, brothers of the Taizé Community, working with with churches of various denominations, facilitated a “pilgrimage of trust” in the St. Louis area. At a time when fear and violence seemed to be gaining the upper hand, the purpose of the pilgrimage was to create a space where people of different backgrounds could come together for prayer and conversation on concrete ways of building trust in people’s daily lives. This yearlong pilgrimage of trust culminated in a gathering held over Memorial Day weekend, May 26-29, 2017.